Quality | Tatár Pékség Kft. TATÁR PÉKSÉG KFT. strives to satisfy customer needs during the process of producing semi-finished and ready-to-eat products, while ensuring an appropriate level of food safety. 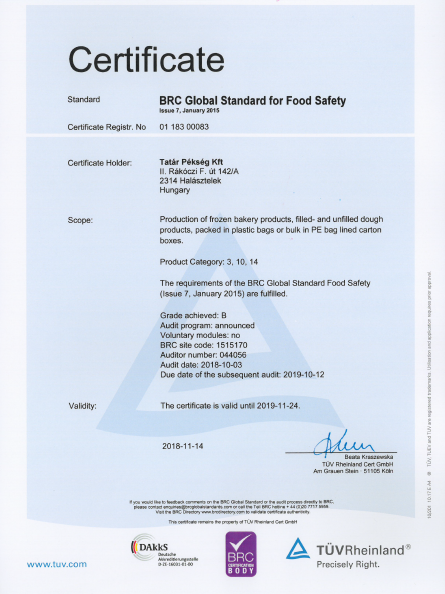 In order to achieve this goal, we have put in place and apply a quality assurance system in line with IFS and BRC Global Standards for Food Safety. Our goal is to respect and focus on our consumers’ health, interests and preferences. Therefore, we maintain close ties with our customers in order to obtain a steady flow of information about their demands and expectations and to win and retain their trust, thereby guaranteeing their satisfaction. Continuous quality improvement is another key priority of ours. Manufacturing top quality products, reliability, and ethical business conduct are prerequisites to a successful market presence, to which each of our employees is committed. 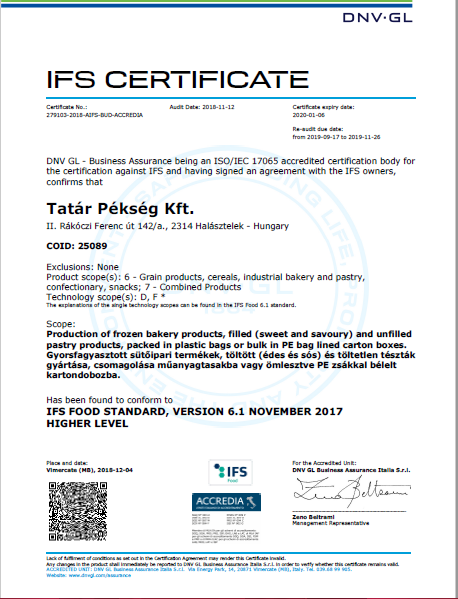 In addition to compliance with food safety requirements, TATÁR PÉKSÉG KFT. explicitly considers environmental and corporate social responsibility and compliance with all relevant statutory requirements to be among its main tasks.